This was the very last duo in this shade and it was sitting on a shelf by its lonesome at Target Canada on closing day. I swooped it up, because it is gorgeous and the colors attracted me like a moth to a flame. 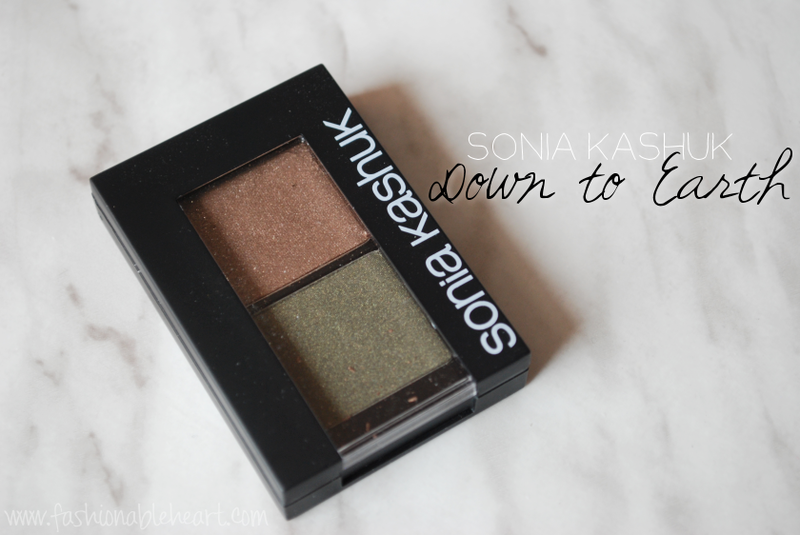 Here are my swatches of Sonia Kashuk's Down to Earth duo. These are so buttery smooth and soft. I like shadows like that, because I find them easier to blend. I didn't really buy it to wear the colors together, so much as the fact that they each stood out to me individually. I can see them working together easily, though. They are extremely pigmented - the swatches above are with one swipe! Because they are so soft, I experienced a bit of fallout due to the softness, but no creasing throughout the day. I don't have many greens in my collection and I am smitten with the golden green in this duo. P.S.- I'd love it if you kept the family of a childhood friend of mine in your thoughts and prayers. David passed away on Sunday and his funeral is today. I went to school with him from first grade until high school graduation. His dad was my doctor all of those years and his sister was also a classmate. My heart is so heavy for them. What lovely eyeshadows! I love that green color! Also I am so sorry for your loss, it's always so sad when those things happen.